TROY — NAI, a manufacturer of cabling and electronic components for the industrial, telecommunications, and medical industries, announced $3 million in new equipment investments at its 25,000-square-foot plant in Gaylord. NAI announced the opening of the plant, at 1258 Old US-27 North, a year ago, and is now expanding its initial operation. The new equipment includes 10 injection molding presses with capacities of 45 to 258 metric tons. The company said the new molding machines feature advanced digital control technology, providing extremely tight tolerances for precision molding. Molded products in Gaylord will support existing customer business, as components will be shipped to NAI’s four plants in Hermosillo, Mexico, where final assembly takes place. In addition, the molding equipment enables NAI to manufacture other custom products and components, extending their ability to manufacture products for new customers and applications, such as medical and surgical devices. The NAI Gaylord plant is currently adding a secondnd shift and will operate a schedule of two 10-hour shifts a day. The company is hiring for related positions. For more information, visit https://www.nai-group.com/about/careers-training/. NAI is also currently building a new clean room in the Gaylord plant for the application of advanced hydrophilic coatings on proprietary medical products and advanced vacuum thermo-sealing of specialty packaging, prior to specialized electron beam sterilization. ISO 13485 certification has been applied for and is expected to be completed in March 2019. The Gaylord plant also supports NAI customers with a U.S. location for design and manufacture of its interconnect assemblies. The Gaylord facility currently manufactures many SKUs for customers who desire a U.S. manufacturing location. One of the largest capital investments NAI is making is in new equipment for manufacturing coaxial assemblies. NAI purchases coaxial cable, coax connectors and other components and performs overmolding, testing and assembly of coax units in its Gaylord plant. NAI currently manufactures industrial-grade coax assemblies with straight and right-angle connectors. Many of these assemblies are used on antenna towers for connecting wireless radios to base equipment. The new coax assembly equipment includes cutting, stripping, additional overmolding and testing equipment, which will allow NAI to manufacture 500 coax assembly units per day by the end of the first quarter of 2019. Plans to increase this capacity are already under way. 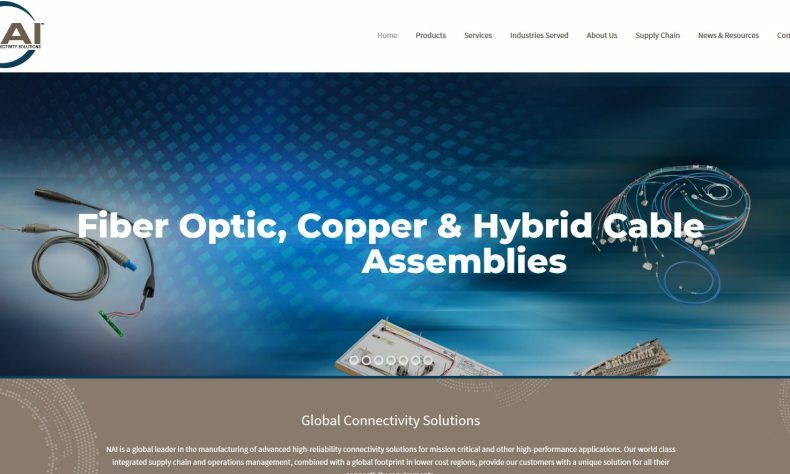 NAI has been a global leader in the manufacturing of advanced mission-critical and high-reliability fiber optic and copper cable assemblies and harnesses since 1993. The company has its Solutions Center in Troy and an administrative office in Scottsdale, Ariz. Besides the four manufacturing plants in Hermosillo, NAI operates a distribution center in Nogales, Ariz., and two manufacturing plants in Suzhou, China.